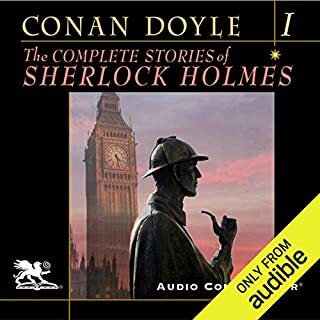 Volume two in this series consists of one novel, The Hound of the Baskervilles, and two collections of short stories, which include "Memoirs of Sherlock Holmes" and "The Return of Sherlock Holmes" (a total of 23 stories). 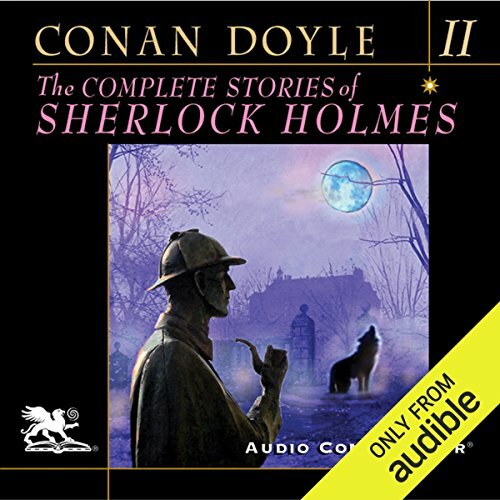 These creations by Doyle represent the finest work of his Holmes series, and certainly the most famous. They are reproduced here (and in all volumes) in the order in which they were first published. First appearing in print in 1890, the character of Sherlock Holmes has now become synonymous worldwide with the concept of a super sleuth. 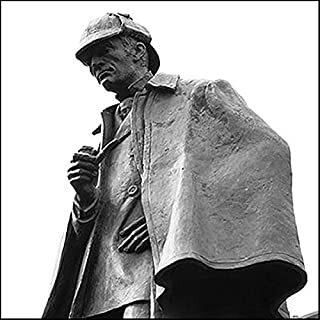 His creator, Conan Doyle, imbued his detective hero with intellectual power, acute observational abilities, a penchant for deductive reasoning and a highly educated use of forensic skills. Indeed, Doyle created the first fictional private detective who used what we now recognize as modern scientific investigative techniques. Doyle ended up writing four novels and 56 short stories featuring Holmes and his companion, Dr. Watson. All but four are told in the first person by Watson, two by Holmes, and two are written in the third person. Together, this series of beautifully written Victorian literature has sold more copies than any other books in the English language, with the exceptions of the Bible and Shakespeare. There isn't much better than "Memoirs of Sherlock Holmes" and "The Return of Sherlock Holmes". These stories show ACD at the top of his game. Like I mentioned in my review of Volume 1, the brilliance of Doyle's detective stories is they are universal, they are timeless and they are -- elementary. While Doyle is a master of short stories, he isn't a consistent distance writer, and his previous longer pieces were usually a tad uneven (Study in Scarlet, Sign of Four). However, with "Hound of the Baskervilles", Doyle shows a marked improvement. All-in-all this is a wonderful collection of some of Doyle's finest pieces. Definitely not to be missed. Griffin is a wonderful narrator for Sherlock Holmes. His range is impressive, yet he still manages to not hog the stage. His narration is varied, but still rather understated. This narrator is almost perfect for the part. It's a big job -- there are tens of characters across the stories. He's got a great accent and keeps the characters straight. So he speaks with what *sounds* like an English accent, but he mispronounces common words like "disconsolate" which he says "disconSOlate" instead of "disCONsolate" and he calls Charing cross (which should rhyme with "bearing"), Charring cross. He rhymes it with "barring". He calls Sydenham, Sidenham (it should be Sid to rhyme with Hid not side to rhyme with hide). And he calls Norwich nor-which instead of the more proper "Norritch". He pronounces the word "clerk" in the American fashion rhyming it with Berk instead of the proper English pronunciation Clark. It's infuriating and maddening. It ruins a perfectly good delivery. His narration is practically flawless in every other respect, but holy smoke: if you're reading about England, try to learn the names of the places before you start. And it's strange because these Americanisms come out of a very plummy if old-fashioned Engish accent. If you can bear the occasional mangling of a place name or an unusual adjective (he says trusulent for truculent) then this is for you. But if you're English, then maybe it's more than sanity can bear. My suggestion: buy the first one and see if you can stand it. I've bought two volumes now, and it's touch and go if I'll buy the third. The stories hold up surprisingly well, 120 years after they were written. They pre-date fingerprinting, for example, and even the internal combustion engine; but the principles of forensics laid down here, and the structure of the stories is echoed across the decades by everybody we now know, from Kathy Reichs to Lee Child. I read them all as a boy, of course. This has been a wonderful way to re-read them. Barring of course the egregious pronunciation which is slowly driving me completely mad. 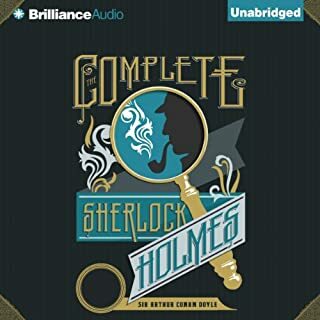 This audiobook combines two Holmes collections (The Memoirs of Sherlock Holmes and The Return of Sherlock Holmes) and one novel (The Hound of the Baskervilles). 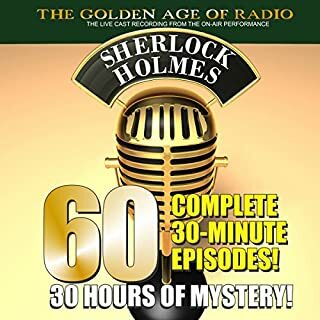 The near 28 hours of stories make a solid addition to the Holmes canon, cleanly and vividly written, with occasional flashes of humor, brilliance, and intellectual play. They even include the death and resurrection of Doyle’s genius detective. Sometimes the culprit is rather guessable early on, and there is little action in the way of gunfights and brawls and the like. But it is a pleasure to watch Holmes at work through Watson’s idolizing eyes. As for Charlton Griffin’s reading of the three books, it is appealing if you like his voice and approach to reading in general. I first heard him reading The Iliad and found it wonderful. As in that book, in this one his pronunciation of words is clear and his delivery authoritative. He does tend to get rolling on the Griffin Rhythm, which at times threatens to make the different books by different authors he reads sound as if they were written by the same person. But I do like his distinctive style. Because Griffin is American, his British accents may be a little dodgy, but he uses an effective, neutrally British-flavored accent for Watson’s narration. And his Holmes is pleasurably intellectual, proud, and sardonic. 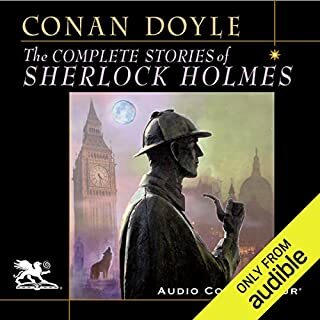 The only criticism I’d make is that most of his women sound simpering, nasal, high-pitched, and weak; I wish he’d try less hard to make them sound “female.” But the majority of voices in this audiobook are male, and he’s quite good with them. Griffin effectively uses mood music related to the subjects of the stories to introduce and conclude each one, as well as spooky hound howls to introduce the chapters of The Hound of the Baskervilles. Apart from one story featuring gunshots, there are no other sound effects in this audiobook. In conclusion, this is a fine Holmes collection. With stories that have stood the test of time as well as these have, the question of their purchase-worthiness does not arise. The only issue, in the case of an audio edition, is whether the reader is up to the task and Charlton Griffin is consistently superb. I was lucky enough the snag all three volumes during sales, but they are well worth full price. I downloaded this after watching Guy Ritchie's god awful film "Sherlock Holmes." I loved Shelock Holmes when I was younger, and remember him being an interesting, complicated, multifaceted character who had many exciting -- sometimes violent -- adventures. Ritchie's film turned Holmes into an action star / weirdo -- and his 'adventure' in the film was absurd instead of clever. It was nice to re-read Sherlock Holmes and discover that I was right about him all along -- much more interesting and exciting a character than in that silly movie. The audio book itself has excellent narration -- crisp, convincing, and with very subtle voicework. The audio quality (format 4) was a little hissy, but i suspect this is because the original recording is slightly older. Spend your credit -- rediscover Holmes. Oh dear! Don't bother with this rubbish. 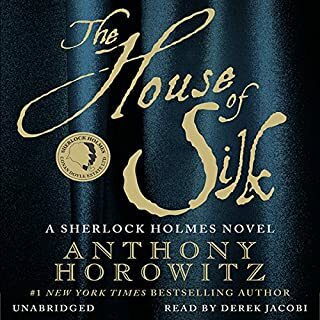 I'm a big fan of Sherlock Holmes and was really looking forward to listening to this but the sad fact is the narrator is absolutely appalling. He totally spoils the whole recording with his strange pronunciations, accents and bizarre characterizations. You should look for another narrator. The older British public seem to prefer their “classics” read in deep, resonant, “classic BBC” voices, out of a belief that it lends gravity to our profound literary heritage. Factors influencing that preference would be the regular diet of recordings of Shakespeare plays received in school, and the popular costume dramas seen at the cinema, on TV, and heard on the radio. Ironically, we also have a love of authenticity, but only when it suits us ! From an audio book perspective, we should want the narrative of Dracula read with an Irish accent, and the Count’s dialogue a la Bela Lugosi : “Leeson to zem, ze cheeldren of ze nat. What mewsic zay mek !” But contrary as ever, most of us want the lot Christopher Lee style. If money is no object, and you love Sherlock, get all three ! Realistically, prioritising your requirements is the best way forward : cost, completeness, or sound.